In January 1990, as a part of negotiations for a new Salary MOU for units 611 & 612, ALADS and PPOA established the Peace Officers’ Relief Fund (PORF). The purpose of PORF is to provide you the peace of mind that comes with knowing that income will continue in the event of an injury or illness, on or off-duty. PORF is a benefit that you receive at no cost to you. PORF is entirely funded by the County as a result of salary negotiations with your Bargaining Team. Who is eligible for PORF? All Full-time, Active sworn peace officers belonging to Bargaining Units 611 and 612: Deputies, Sergeants, Lieutenants, and District Attorney Investigators (DAIs). How do I obtain the PORF benefit information booklet? ALADS members can call 800-842-6635. PPOA members can call 323-261-3010. What is the Long Term Disability (LTD) Benefit? Maximum monthly benefit = up to 60% of gross monthly salary (at time of disability) to a maximum of $7,000. Minimum monthly benefit = $100. Covers injury/illness on or off-duty. Waiting Period = 90 consecutive days of Total Disability. Will the PORF benefit I receive be offset by other benefits? When does the PORF LTD benefit terminate? When claimant returns to work (no longer disabled) or age 65. ALADS members may call 800-842-6635. PPOA members may call 323-261-3010. Is the LTD benefit taxable income? Will the LTD benefit affect my retirement or workers compensation settlement with the County? Will the LTD benefit be deducted from my paycheck? No. The PORF disability benefit is not a part of your regular salary/income. How will you know how much I earn each month while I’m off? The PORF Administrator will request your current payroll information from the respective department and provide that information to the insurance carrier. If I am on 50% Sick time, will I get the other 50% from PORF? No. The PORF disability benefit is not a part of your regular salary/income. The Plan pays up to a maximum of 60% of your gross monthly salary, “income before taxes” less 4850/work comp time, Sick time, or retirement money earned for the month, for each month you are approved to receive the PORF benefit. Can I file a claim for an injury that occurred 5 years ago? You may request claim forms, but, (1) it would be up to the insurance company to decide if they will honor the claim after such a long time, and (2) because we obtain monthly pay status info from payroll office, it may delay processing of claim beyond the average 5 week timeframe. Is there an Accelerated Benefit option? 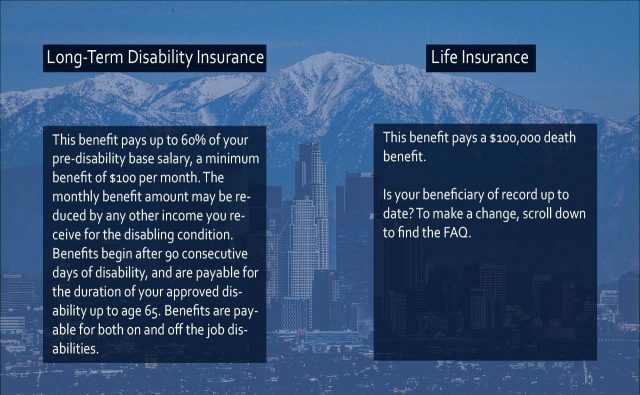 The Living Benefit will be an amount equal to 50% of the Death Benefit applicable to the Insured under the Policy on the date of the Certification of Terminal Illness, subject to a maximum benefit of $50,000. Can I continue the life insurance benefit during an absence? Injury/Sickness: 24 months following date active work ceased. Temp Layoff/Approved Leave of Absence: 12 months following date active work ceased. Labor Dispute: For the absence up to the earliest of the following – (a) the expiration of 6 months from the date you ceased active employment because of a labor dispute with your employer (b) the date you accept active employment with another employer (c) the date coinciding with the end of the last period for which required premiums are not paid (d) the date the Labor Dispute has ended. Simply call one of the numbers below and a beneficiary designation form will be mailed to you. Does this LTD/GTL insurance coverage include an Emergency Travel benefit?